De Surinaamsche Bank, with its 350 employees, is the largest commercial bank in Suriname. It opened its doors to the public on 19 July, 1865, and celebrated its 145th anniversary in 2010. 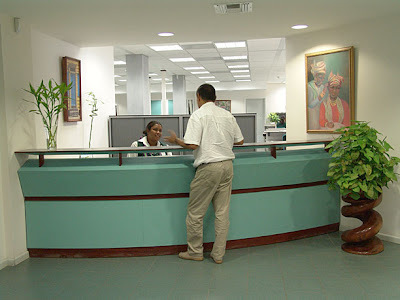 The head office is supported by five branch offices and two agencies in the Nickerie and Marowijne districts. 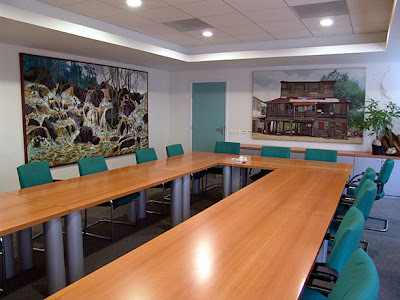 Visual art has always been an important aspect of the bank’s culture. Five years ago, when DSB celebrated its 140th anniversary, it presented its own art collection to the public — a most valuable collection which is praised unanimously by art lovers — by holding an exhibition under the title Visible and publishing an art catalogue (author/editor Chandra van Binnendijk) with the same title. DSB is one of the main sponsors of Paramaribo SPAN, and the bank’s headquarters on Henk Arron Straat in Paramaribo is the central exhibition venue. “With this art event we want to express that this bank has its roots in the community. Through art we want to give back to the community on the occasion of our anniversary. Art is an expression and a reflection of how a community thinks and feels. In our case it reflects the fine complexity and the fine tolerance of our society. “I am most curious! [Paramaribo SPAN] is very new and positively challenging. The challenge is one of the beautiful elements of this exhibition. “I find the name of the exhibition appropriate in so many different ways. Just this week we had a meeting with all the department managers, and we discussed the many meanings of the word ‘span’. The word itself also has something elusive, and that makes the whole event even more fun.